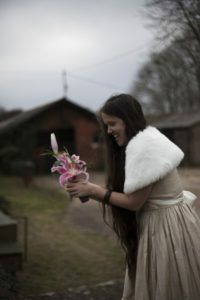 Grace Gelder lives in London where she works as a photographer and arts workshop facilitator. After completing an MA in Documentary Photography, she has been focusing on portraiture that challenges traditional expectations and ideas around a photoshoot, and our relationship to ourselves. She also facilitates photography workshops with a range of groups, often collaborating with charities and organisations that support women’s empowerment and wellbeing. Since her Self Marriage went viral she has integrated speaking and writing about it into her work and life. Her recent TEDx talk can be viewed here. I had the idea to marry myself while daydreaming one Monday morning in October 2013. It was an enjoyable daydream, born out of an urge to make some form of commitment to myself at the start of my 30s. I set a date, invited people who were closest to me, and the private ceremony went ahead on March 16th 2014. So many of the decisions around the wedding were last minute, collaborative and playful and there were around fifty people who showed up to celebrate with me that day, to witness the vows that I made to myself. To take excellent care of myself, practically, financially and physically. What I couldn’t have realised at that moment, simply following a hunch – a fleeting idea, was that making vows in front of a room full of people is a powerful thing to do. Five months of wedding planning (including all the hesitation, questioning, refining and doubt) before the actual moment of saying the vows out loud inevitably gave them some weight. That on top of the presence that permeates the room when they are being spoken; I could never have imagined what that felt like. It also turned out, that making vows has far-reaching long term consequences that command actual change. I’ll elaborate on that later. Instead of taking some time out in the countryside for a version of a honeymoon like I’d planned, I decided to go straight home and carry on with my life. The ceremony was a bewildering experience, so that felt like the best next steps. I shared some pictures with friends on facebook and recounted the story to those who asked but it was quickly something that had happened and that I’d marked with a ring to wear on my finger for years to come. The ring reminded me about the vows, and the vows reminded me of the most important agreements that I had with myself, distilled down from many possibilities and priorities. It wasn’t until a journalist saw my celebrant Tiu speak about her work and mention my self marriage six months later, that the topic resurfaced. He wrote and asked if he could interview me and pitch the story to some newspapers and I agreed on the condition that I could check the final draft. The Guardian ran the story in October 2014 and what I thought would be a small piece that a few people would see and share on social media, became viral overnight around the world. By the end of the week I was relying on some of those wedding vows rather heavily – especially the first. Taking excellent care of myself became a top priority and was quite difficult at times. Within the first three days I’d been interviewed for Russian and Australian TV, appeared on Radio 4’s Today programme and I was interviewed over the phone by countless other news outlets. After seeing how some tabloids were interpreting the story without interviewing me, I realised that following my intuition about who I spoke with was key. I said no to all the newspapers I didn’t like (such as the Daily Mail) who approached me for exclusive interviews. I said no to the old man who offered to be my agent, I said no to the crappy women’s magazines and I said no to prime time TV in the UK on news channels that I didn’t like. I said yes to interviews where I got to travel the world or have an intelligent conversation with the hosts as this fitted with my vow to nourish my adventurous spirit. The reaction to my story in the media was incredibly mixed. There were many critics, slating what I’d done for being narcissistic or self obsessed. There were people who were angry as they thought that the whole thing was a publicity stunt, there were those who were annoyed that I’d called it a marriage There were those who loved it, who thought it was a powerful rebellious act and there were those who actually understood some of my motivations. As someone who has been passionately interested in women’s empowerment since I was 15 (and I could probably trace it back further) I couldn’t help but look closer at what I’d done, and examine all of the threads that had woven themselves together to make a self marriage. I’d been single for a while and had been utilising the time to myself to explore what makes me tick as a human, answering the questions that seem to arise for many people approaching 30 – Who am I? What is my contribution to the world? I’d tried various methods of deepening a knowledge of myself so I’d seen glimpses of the aforementioned threads. I was aware that my tendency in relationships was to err on the side of merging with the other and this would often see me feeling relieved when we’d part ways as I felt like I had returned to myself again. Before entering into another relationship I knew that I wanted to strengthen my sense of self and ritualising a commitment to that was a big part of my self marriage. I also realised how important it is to acknowledge what a privileged position I’m in, to be able to make the choices I’ve made – a few generations ago it was dangerous as a woman to have a career let alone create your own rite of passage. Two and a half years on and the vows are very much alive. I constantly catch myself noticing that something I’m doing is a step towards one of them: facing health concerns, taking care to support my creative practice, planning adventures in foreign lands – these are all examples of this and I have many more. It isn’t always easy and it has required me to go through an uncomfortable process of understanding why certain aspects of my life aren’t flowing as I’d like them to. On the plus side marrying myself has been a catalyst for me to take up more space, express myself more and challenge attitudes and systems that I don’t agree with. This sometimes makes other people perceive me to be more dangerous as I am much quicker to challenge injustice, abusive behaviour and I’m less likely to be silent about misogyny. I’m more sensitive to unhealthy power dynamics than I was before and have become more committed to calling them out in my chosen way. More sensitivity to unhealthy aspects of society sometimes brings with it feelings of vulnerability and powerlessness so I’ve learnt to be friendlier to myself during those times. In terms of of relationships, I couldn’t help but smile at how many times people have asked what I’d do if I met someone I want to be in a long term relationship with. It seems this is a common fear that others have for me; that I can no longer be in an intimate relationship with another person without a ritualised divorce. People often thought that I’d deliberately removed myself from the pool of eligible singles – completely missing the point that this was a symbolic ceremony with no legal basis. I have for example been on dates since the ceremony without feeling like I’m cheating on myself. I’m curious why more people don’t default to the concept that a healthy relationship with ourselves is a requirement of building a healthy relationship with another person- this is something that can be overlooked all too easily. The kind of relationship I want involves two people who love and care for themselves as well as each other, not two people looking to each other to be fulfilled. I feel very connected to women’s history and I’m sure that a few generations ago those in my family and the communities that they were part of would never have imagined dreaming up a self marriage and it being celebrated so publicly. This is a nod to all women who were and are dangerous in imagination when they couldn’t be dangerous in action. It is also an encouragement to people of all genders everywhere to imagine what your vows would be, if you were to make some for yourself.